Keyboard surveillance tool run invisibly and monitor what your family members are doing on your computer in your absence. Software automatically makes an encrypted log file that stores complete information of used application of computer. 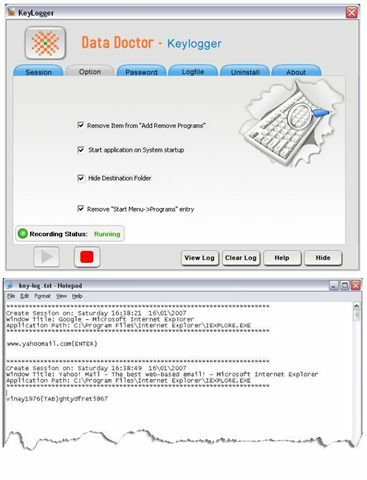 Keylogging tool securely record email username, password, visited website URL and key press activities. Keylogger tool is not visible in Windows application including Task manager, start menu and control panel. ...... interrupting other running application of computer. Software is as such design that it completely undetectable when scanned with any antivirus or anti keylogger products. Keyboard tracker system is used with any windows operating system including Windows Vista Home Basic, Vista Ultimate, Vista Enterprise, ME, XP, 2003 server, 2000, NT and 98. Utility automatically start on windows startup and save captured information in an encrypted log file for surveillance purpose. Keylogger software is helpful for administrator and parents for observing each action and activity of client and spouses respectively and immediately send a detail email to user specified email id. Easy to use and provides a very sophisticated way to keep an eye on all action that were performed on your computer when you are away. Qweas is providing links to Keylogging Software 2.0.1.5 as a courtesy, and makes no representations regarding Keylogging Software or any other applications or any information related thereto. Any questions, complaints or claims regarding this application Keylogging Software 2.0.1.5 must be directed to the appropriate software vendor. You may click the publisher link of Keylogging Software on the top of this page to get more details about the vendor.